EveryQuest QuestGivers is a seperate database of quest givers and the quests that they give to be displayed on your minimap and world map. Use the same great filters from EveryQuest on your maps! Find the Category filters on the Quest Givers option page. Use base EveryQuest filters on QuestGivers, plus Category filters. Please direct all support requests to Wowace. Displays a (!) on your world map and minimap where quest givers appear in game (if an NPC has more then 1 location, the mark on the map is averaged so it might not be spot on all the time). Icons can be hidden on each map individually and also based on if you are tracking low level quests. As you complete quests and EveryQuest logs them, the minimap and world map update and remove completed quests from being displayed. Due to the nature of this being a module of EveryQuest, you can filter what gets shown on maps using EveryQuest filters. Additional category filters are made available for just the Quest Givers module. 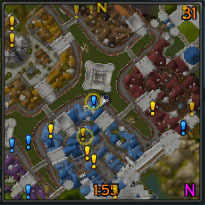 Any NPC can be sent to TomTom or hidden (by setting the quests that the NPC gives to ignored status in EveryQuest) by right clicking the icon on the World Map. The Quest Givers module uses EveryQuests filtering system along with additional category filters on the Quest Givers option pane. You can also set Quest Givers to ignore EveryQuest's status filter and use its own status filter (Hides all completed and in progress quests). Just Downloaded your addon and its not working it doesnt show any of the quests on the map at all. Any ideas. I did the server query and it said it was ready to populate but when i went to populate 0 would populate??? I only downloaded and installed everyquestgivers & everyquest is there one or more i need to download to help this work???? I like your modification that changes the display to show all of a NPC's quests, that's much more useful than just saying X quests left. I'm a total bust as a programmer though so I'm not really sure with release 29 where to make the changes. Could you add a new note here giving the line numbers and changes for release 29, and also the line numbers for the two lines that populate the tooltip? It would also be helpful if you listed the lines being replaced so programming dummies like me can see exactly what needs to be replaced. handynotes are still shown for already completed quests, am i doing something wrong? cheers. tho new quests completed are removed. i like your modification, it'm more like Handynotes quest giver now! i'll appreciate if it would be possible to display ONLY missing's quest names, not all guest giver's quest and missing quest in rounds... what do u think about? This is a change I keep on making locally, wondering if you'd be interested incorporating it. Cartographer is no longer updated, it is certainly not dead. So many people use this addon still, and it is far from broken. I manually did it...but the toc for this addy as d/l'ed today (r18) is still sitting at 30200 and needs to be updated to 30300. Thanks for the great addon! how will you deal with quests started by items that drop? Id suggest questgiver for this quest is the mob which drops the item, so you are sent in the right direction when you want to do that quest. also it would be great if you could filter questgivers that only offer quests based on classes /professions.